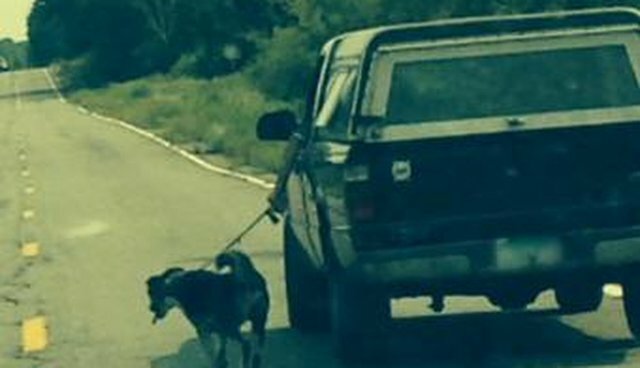 An image that went viral on Facebook shows a man walking his dog - while driving. A woman became concerned when she saw him, driving at a slow pace with the leash dangling from the driver's window. She posted the picture to Facebook, and people were pretty outraged, KARE 11 reported. Apparently it's been happening for years. The owner of the dog, a 10-year-old Australian cattle mix named Blue, told police he's in his 60s and began walking Blue from the car because it was too difficult for him to keep up. Common sense would tell us this is a bad idea: Even though Blue's owner says he goes no more than 5 miles an hour, another car could hit Blue, he could be dragged or any other number of dangerous situations could occur. But the Isanti County Sheriff's Office, in Minnesota, said in a Facebook post that Blue's owner did not violate any law. "The deputy spent time with the owner and the dog interviewing the owner and the owner states he knows his dog cannot run 30 mph and was driving at idle speed. The dog is healthy and sees the vet regularly," a statement on the sheriff's Facebook page read. "The deputy pet and played with the dog, looked over the dog for any injuries and noted there is NO injuries and no sign of neglect by the owner. The dog was in great spirits." We're glad Blue appears healthy and safe. We just wish his owner had heard of a dog walker.